My interest in military modelling goes back equally as far as my interest in railways, to my days as a small child when my father built a model of a Messerschmitt 262, and a Blackburn Buccaneer of the Fleet Air Arm; this started me on the Airfix kit route and by the end of my schooldays my bedroom was an amass of aircraft, ships, tanks and all manner of military models: my mother used to bitterly complain that she could not dust my room for fear of breaking something - which she did from time to time. My family, like many, has an association spread over two world wars with the military, taking in the Royal Navy, the Royal Air Force, and the British Army in which various family members have served, and one uncle served in the Royal Navy in both the First and the Second World War. I have childhood memories of large portraits of men in uniform hanging on the walls of the old family cottage. So here is the first kit build for this section of my website, and as you can see, something of a crossover between military and railway modelling, also serving my interest and love of winter landscapes, and my interest in Russian military history both before and after 1917. 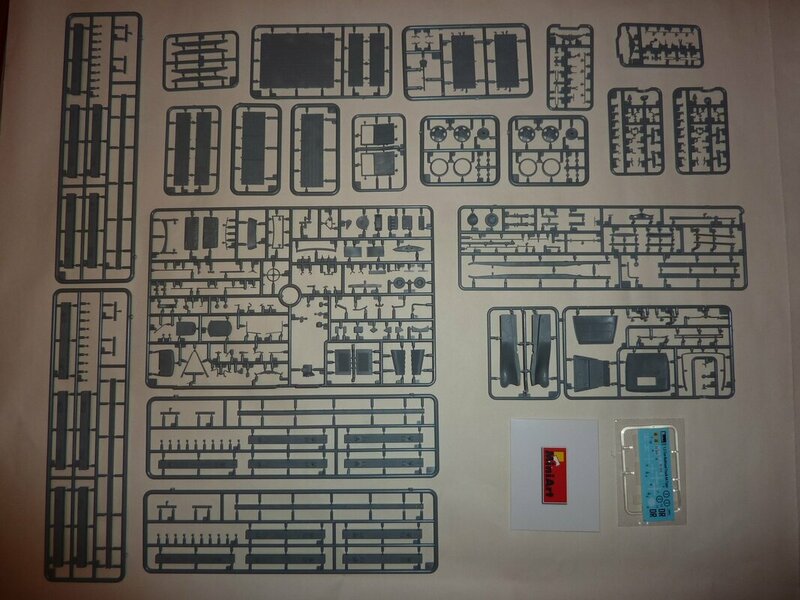 The assembled collection of parts from the box, neatly laid out and all accounted for; the white envelope emblazoned MiniArt contains the photo-etched metal parts that come with the kit, some are very tiny indeed; there are also four sections of railway track included in the box. 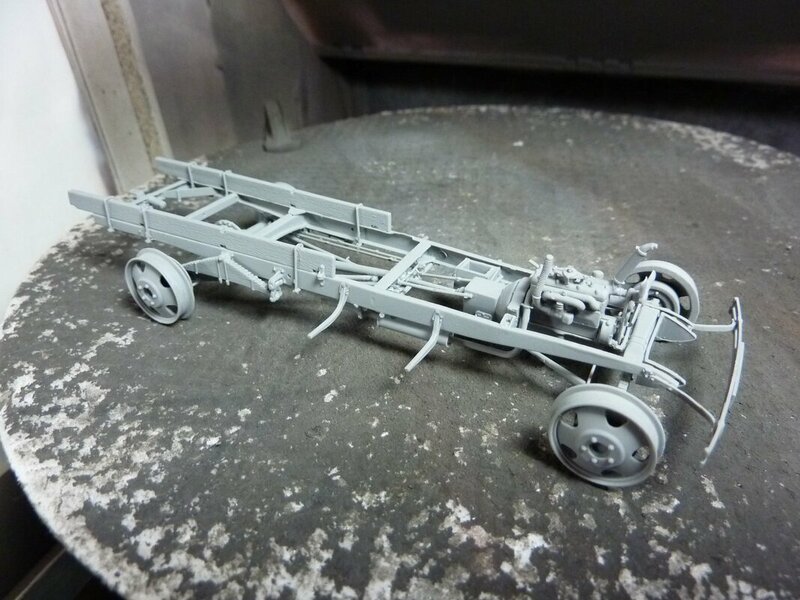 The near completed chassis, lightly sprayed with Humbrol Primer No-1 at this stage; the radiator has been left off to allow greater access for painting the engine and cooling fan. 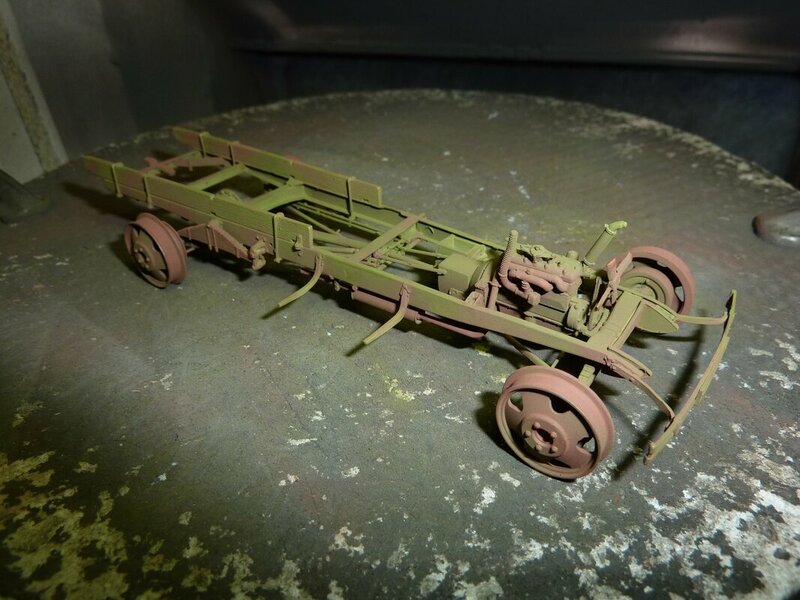 A small single section of track was assembled to aid the alignment and fixing of the rail wheels, and to ensure that the chassis sat four square at each corner. On the subject of railway track that supplied with the kit is to the European Standard gauge, including Britain, of 4 feet, 8 and 1/2 inches or 147.83 cm; whereas the Russian gauge of 5 feet or 152.4 cm is not catered for in the kit, which is disappointing as the kit provides parts to build the Railroad truck to the Russian gauge. The Russian gauge track is available separately from MiniArt; but as only one or two at the most track sections are needed to display the completed model, and as four track sections are provided in the kit, why not provide two European gauge track sections and two Russian gauge track sections? In 1/35 scale the European gauge is 42.24mm and the Russian gauge is 43.54mm. A note of interest is that the Russian gauge has a military strength in itself, and was not chosen at random; in both the First and Second World Wars railways were an essential part of mobilization - without the railways of Great Britain the build up for the Normandy landings would have been impossible, as indeed would have been the logistics to wage war across Europe after the Normandy landings without railway support to the advancing Allied armies. Military minds have long since recognized the importance of railways, and the fact that Germany and France and Great Britain shared a common gauge made advancement across Europe with all manner of supplies a whole lot easier for the Allies - a fact not lost upon the Russians, hence their choice of a rail gauge different from the countries surrounding Russia; all the Russians have to do is withdraw their railway locomotives and rolling stock from falling into enemy hands and the invading army will be forced to expend huge amounts of energy and time reducing the Russian gauge to Standard gauge before it can use its own railway locomotives and rolling stock to supply its own army into Russian territory; of course, when the advance fails, usually in the face of the Russian winter or the slithering mud, and the Russian counter attack drives back the invaders, the Russians themselves have to restore their track back to the 5 foot gauge as they advance; but this is a small price to pay and Russian engineering is nothing if not vast and of a large scale, being masters of their environment. The Russian loading gauge allows a massive seventeen feet above rail height. 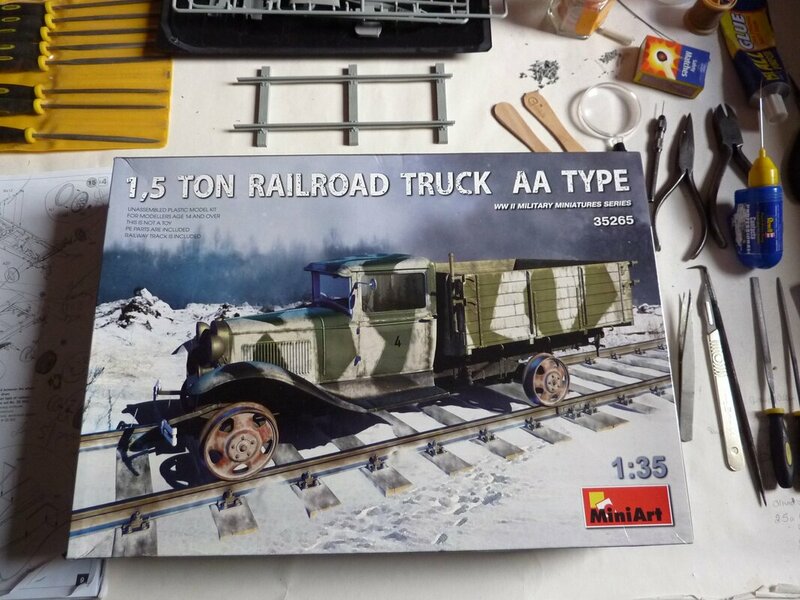 However, back to my humble Railroad truck which will be included in a diorama that is already part constructed, and will include Russian figures to match; more anon on that and the Railroad truck as construction and painting advances: watch this space. After allowing the primer to harden off for a few days the first coats of colour have been very simply applied using a 1.5 nozzle airbrush and 50/50 thinned Humbrol 150 Forest Green (Russian Green) and Humbrol 113 Rust then later added to the remains of the green mix to promote a slightly pink shade; everything is kept very loose, soft, and flowing at this stage, colours are blended, hard edges avoided, there is nothing in the colour that cannot be developed, or darkened or lightened as the model evolves: this is very much establishing the underpainting, and is a process similar to that employed in portrait painting; except, I am here creating a three-dimensional portrait. Progress with the build has been slow of late, due to the commission work I am engaged upon; however, I wanted to upload this image because it has important implications for anyone building this kit, which shows construction at stage 20 in the instruction sheet; it is important to paint and fit the radiator before fitting the front wings, otherwise problems with the wings encroaching into the space for the radiator can occur, it is a tight fit. The other problem is when the crossbeams, parts Ce2 and Ce3 seen in grey above, come to be fitted across the chassis beams at the rear, these too are a tight fit on the slots provided in the lower edge of parts Ce2 and Ce3 and any inaccuracies in the vertical alignment of the two chassis beams Ba5 and Ba6 will result in the crossbeams not fitting on their slots, with the only recourse being to either open out the slots or try and bend the chassis beams to fit the slots with the risk of distorting the chassis. My remedy for this is to take parts Ce2 and Ce3 from the sprue much earlier at stage 6 and use these as a dry fit guide during the early stages of the chassis construction to ensure that the chassis beams Ba5 and Ba6 are in true alignment, so that by the time stage 20 is reached it is already known that parts Ce2 and Ce3 will fit perfectly. Overall, right from the start, accuracy and squareness in the chassis construction is vital as the basis for obtaining a good platform upon which to build the superstructure, this is also why I constructed a short section of the railway track, using just three sleepers, as a try track to ensure everything sits square on the wheels. This is a pretty straightforward kit, but patience and care are essential to produce what the kit is capable of producing: a solid and sturdy chassis to support the superstructure. The front wings have been distressed with some homemade battle damage and dents suitable for the diorama this model is destined to occupy at a later stage. This is a good kit, an interesting kit, and with a number of varied painting and weathering options ahead for those who wish to employ some artistic flair. More to follow.